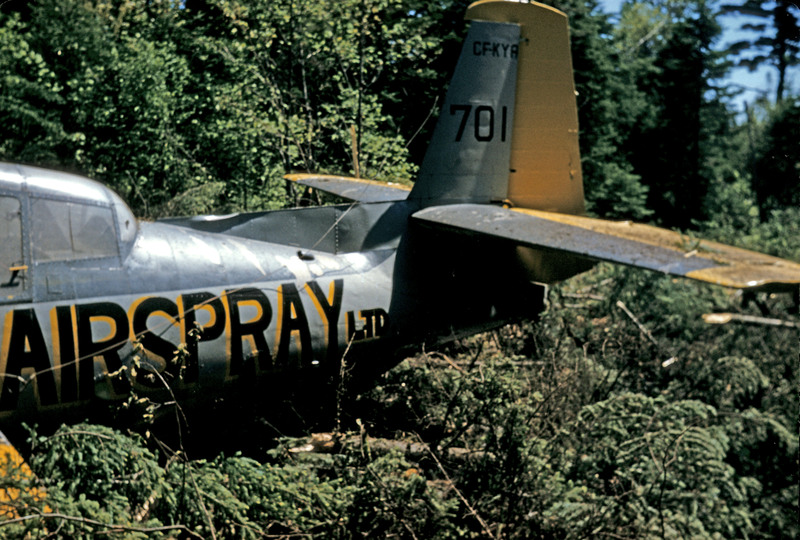 Air Spray supplied only one TBM for the spray program, which crashed in 1960, its only year in NB. There is no record of its sister aircraft, FKPJ, which went to Sis-Q as N68663 then Evergreen as C-GLEG, ever coming to NB. Perhaps it did? Furthermore, the article below mentions that the company had “a trio” of Avengers. Canada’s Aviation Hall of Fame is also located in Wetaskiwin, which is just south of Edmonton, Alberta. 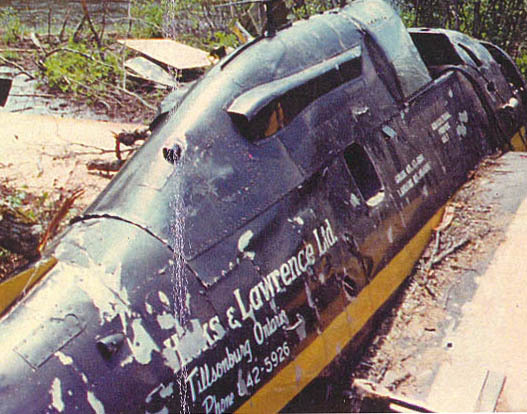 Airspray Ltd. TBM#701 (CF-KYA) wreckage, Fredericton NB, 1960. The company name is now black over yellow. In February 1954, 27-year-old David Harrington created Airspray Ltd. in Wetaskiwin, Alta. The company provided crop dusting services with light aircraft …. In July 1961, Airspray was awarded its first fire suppression contract from the Province of Alberta. Its expanded fleet now included a trio of Grumman TBM Avengers and a pair of Boeing Stearman biplanes [one of which sprayed in New Brunswick for a year or two -CA]. In 1967 Harrington renamed the company Mercury Flights Ltd., but later that year it became Air Spray (1967) Ltd. The ownership of this group of twelve Avengers jumped around among one U.S. and three Canadian companies for a period of eight years. All were of U.S. origin. Nine crashed and were written off, and only two survived to 1985 when they were sold by Hicks and Lawrence. The twelfth is at a museum in Alberta. Details and origins of Hicks and Lawrence, Hillcrest, Maritime and Miramichi avengers. Cdn. Reg’n. BuNo Tail No. Origin U.S. Reg’n. 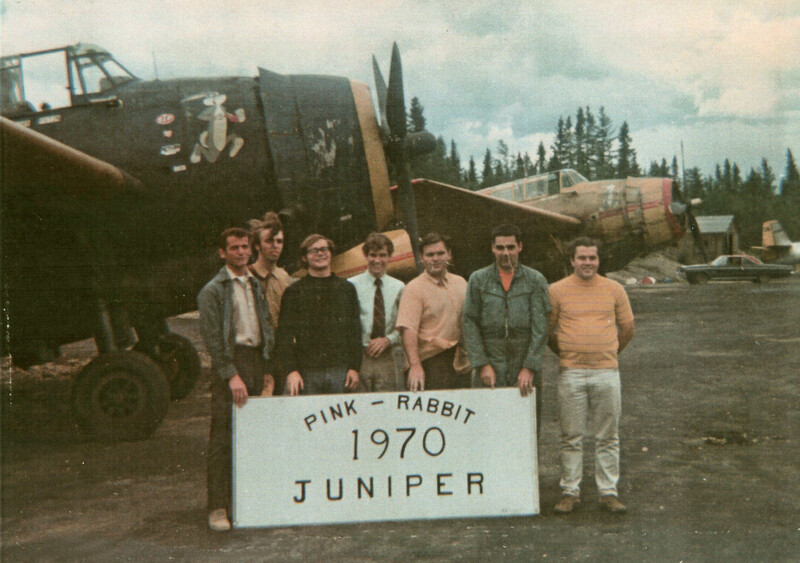 A jumble of Hillcrest (Hill – bold), Maritime (Mar) and Miramichi (Mir) avengers in the mid-spray period, 1969 to 1976, followed by Hicks and Lawrence (H&L) avengers, 1972 to 1984. There is a two-year gap (1971-72) in FXOM where the ownership details are lacking. JD Irving Ltd., under its Forest Patrol Ltd. name, conducts aerial herbicide application and forest protection work for its parent company in Canada. One of its aircraft was associated with the FPL spray program during the late sixties, and possibly earlier. J.D. Irving TBM #508, Dunphy, NB, 1969. The aircraft was almost all yellow save for the bit on the tail. Maritime operated three TBMs out of McEwen’s Field, near Moncton, NB, in 1969 and 1970 (see tables above). FXOM and FXON were sold to Hicks and Lawrence and FXOO crashed in Newfoundland in 1969. Maritime AS TBM#911 FXON & MAS #900 FXOM, with their Bugs Bunny logos, FIMW #506 at rear: Pink Rabbit Team, Juniper NB, 1970. L to R: Joe Gagne (#1 Cessna pilot), Doug Johnson (#1 pointer), Dave Scott (#2 pointer), Jim Thompson (#2 Cessna pilot), Claude Marcoux (Lead TBM pilot), John Lavigne (#3 TBM pilot), Barry Paton (#2 TBM pilot). 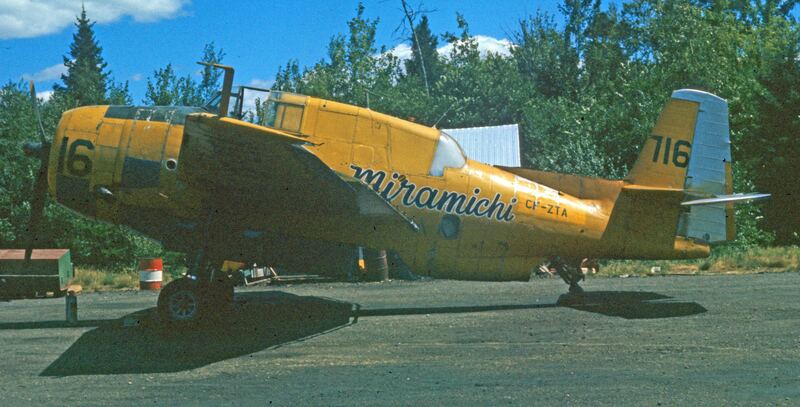 Miramichi Air Service was operated by Andrew Retfalvy. In 1970, he purchased a property known as the Douglastown Airfield from James R. Seel, who operated a licensed air service with one TBM (CF-ZTA). According to a letter to FPL dated 7 December 1971, General Manager Paul Daigle asked FPL if it was possible to temporarily import #A25 under Miramichi Air Service Ltd., in order to work the coming season with FPL. This aircraft and one other (N4049A, later FBEG) were still registered in the United States, and he did not think that it would pass the inspection date of 15 February set by the Canadian Transport Commission. Only N68683 worked in NB that year. See tables above for details of the aircraft. 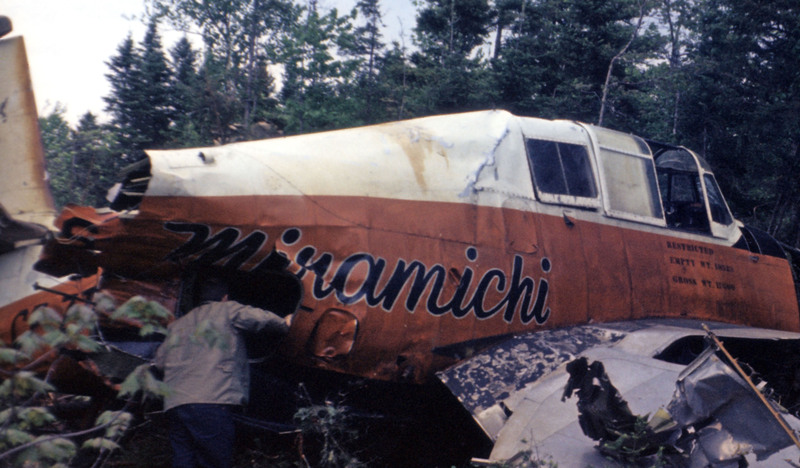 Miramichi Air Service TBM #A23 (CF-ZTS) wreckage, Sevogle ,NB. Crashed 5 June 1973. This aircraft is white above and orange and black below (the Hillcrest colours). Hicks & Lawrence supplied seven TBMs to the spray program from 1971 to 1984 (see table sabove). This company had its TBMs painted in several colour schemes. Hicks and Lawrence has operated since 1947 and now operates out of northern Ontario (Dryden) as a wholly owned subsidiary of Discovery Air Fire Services. Mervin A. L. Hicks (1915-2001) became a pilot in 1941, after constructing airports pre-WWII. … He retired from the R.C.A.F. as a flight lieutenant, and started a flight school near his hometown of Tillsonburg at an abandoned military base. The Government Asset Corporation offered the base to the town for $1. Merv leased the land from the town, and what became known as the “Hicks & Lawrence Airport” was born. Tom Lawrence was in Merv’s first class of students, and they went on to form Hicks & Lawrence in 1947. Tom was to be in charge of the agricultural end of the business, which started by growing corn on the airport grounds, and grew to include what was the foundation of a 65 year old company – crop dusting. The company was first marketed agriculturally in the large local tobacco market. They operated J2 and J3 Cubs, and on to Stearman aircraft in the 1950’s. They purchased war surplus aircraft, including many Harvard’s and B25. 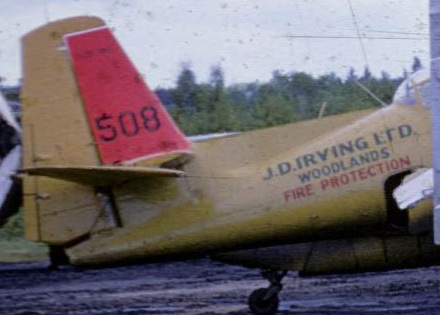 Mervin’s son Duane Sr. expanded to St. Thomas and operated the airport there, while expanding into the North including fire bombing and birddog operations in Dryden. 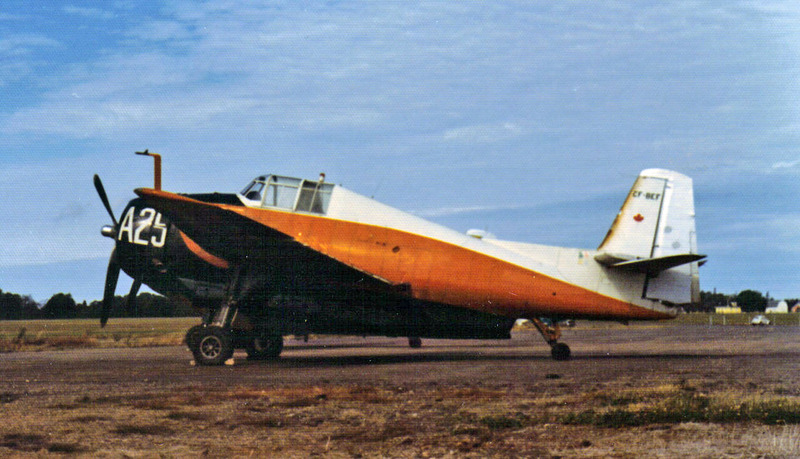 They also operated Grumman TBM Avenger aircraft equipped with a hopper and spray nozzles, spraying in New Brunswick every year from 1969 to 1985. Other spray contracts led to the acquisition of more modern aircraft, such as the PZL-Mielec M-18 Dromader. Duane Sr. took over the company in 1987, and a year later obtained a large fire detection contract with the Ontario Ministry of Natural Resources. At this point Hicks & Lawrence was operating up to 38 aircraft between spray, detection and birddog operations. Duane Jr. … took over aerial (spray) applications in 1989, and sold the spray business less than 8 years later to focus on aerial fire. He purchased the rest of the company in 2001. Hicks and Lawrence colour scheme for TBM #1, FBEG in 1979. Hicks and Lawrence colour scheme for TBM #1, FBEG in 1984. 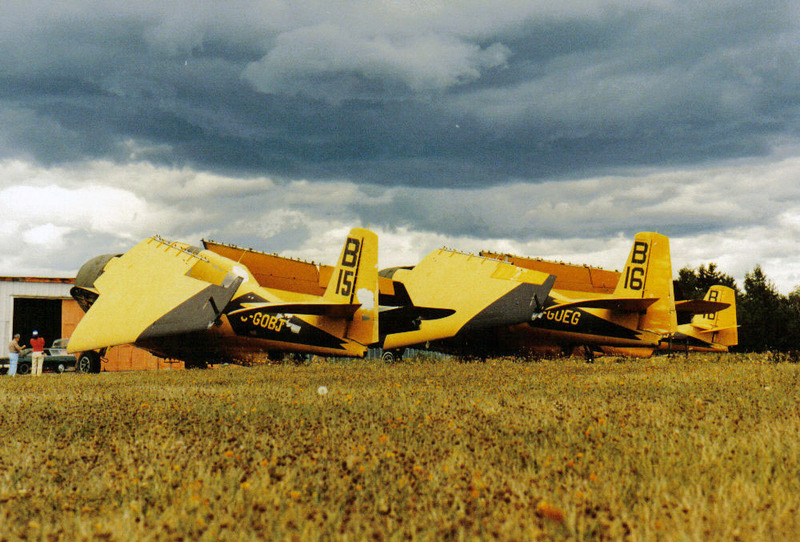 Norfolk obtained three TBMs from Air Tankers Inc., Newcastle, Wyoming, in 1973. Also from Sonora Aviation Inc., Tuscon, Arizona and Carson City, Nevada, and D&D Aero Spraying, Rantoul, Kansas. 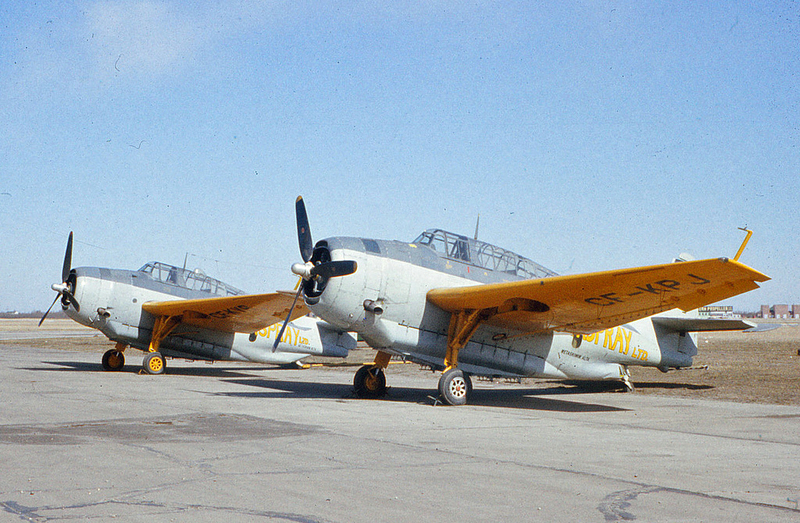 Norfolk supplied seven TBMs to the spray program from 1970 to 1983, and, in later years, also M18 Dromaders. In 1985, Norfolk relocated it’s Fredericton facilities to the Evergreen hangar at the Forest Protection Limited facilities. In 1986, listings for Canadian Companies says that NAS Ltd. Is “Inactive – discontinued on 1986-10-27”. All the Norfolk aircraft with the possible exception of CF-AXS sported a Canadian flag on the tail or on the nose. 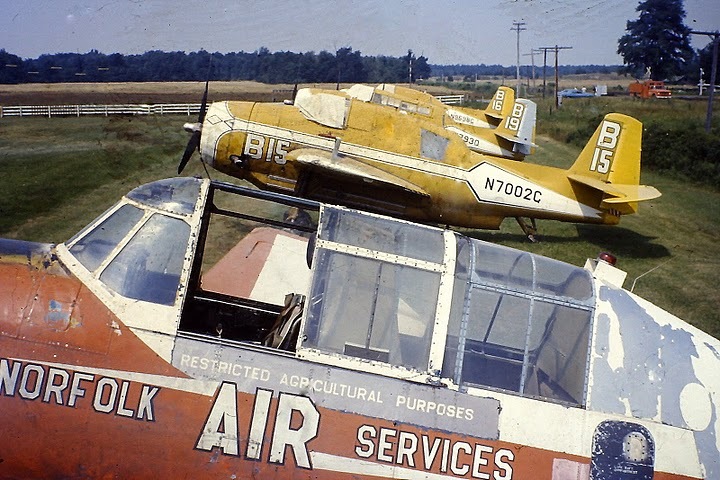 Avengers owned by Norfolk Aerial Spraying from 1970 to 1983, with FPL tail numbers. Avengers owned by Norfolk Aerial Services from 1970 to 1983. AT is Air Tankers Inc. of Wyoming. 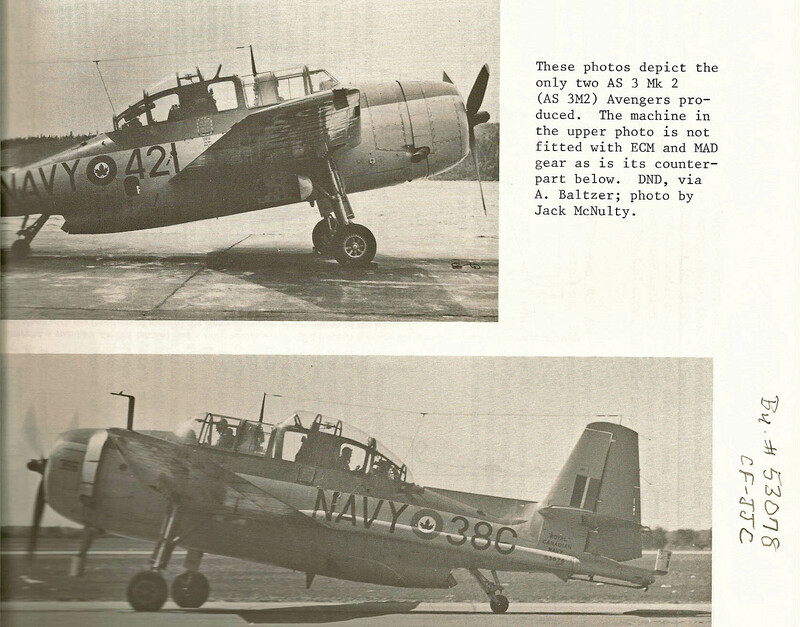 According to Barrie MacLeod’s research in the Civil Aviation Register for 1961, the two Richel Air Avengers were former USN then RCN aircraft: CF-JJB and CF-JJC. The latter is BuNo 53078, which became CF-BEF under Miramichi Air Services. These were apparently the only two “high top” Avengers built. 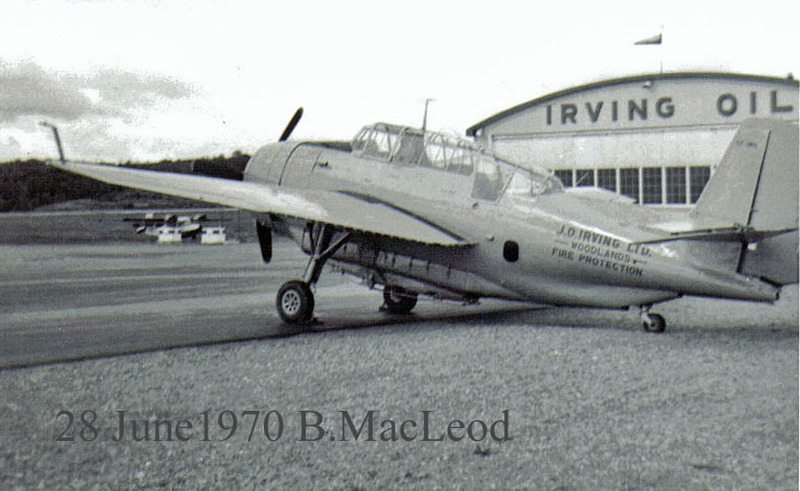 FJJB flew in NB in 1960, but FJJC only flew in NB under Hillcrest Aircraft and later Miramichi Air Services ownership.